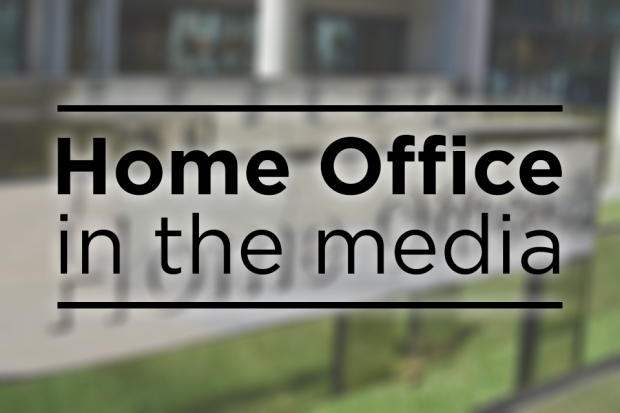 Today’s Home Office-related stories include the Independent Reviewer of Terrorism Legislation’s report into the Westminster terror attack, a Independent Chief Inspector of Borders Immigration report and the Home Secretary’s appearance in front of the Home Affairs Select Committee. The Telegraph, Guardian and Mail are among media to report by Independent Reviewer of Terrorism Legislation Max Hill QC, who published his report into Operation CLASSIFIC – the investigation following the Westminster Bridge attack. The report offers an insight into the police investigation and focuses mainly on the processes followed by the police in arresting, questioning and releasing the 12 individuals that were arrested following the attack. Please find a statement from the Security Minister below on the report. Our comprehensive terrorism legislation gives the police the powers they need to investigate terrorist atrocities and we were all witness to their swift and effective work following the Westminster attack. We are pleased that Max Hill QC has concluded that the investigation was impressive, flexible and fast-moving. We are grateful for the work he has carried out and will respond to his recommendations in due course. The Times and Guardian carry articles on a report by the Independent Chief Inspector of Borders Immigration on exit checks. The papers report that, according to the inspection, some 600,000 were not subjected to exit checks and that the ICIBI recommended that the department re-establishes the Exit Checks Programme. Our statement on the report can be found below. Exit checks are helping us focus operational activity better on those people who do not comply with our immigration rules. Information gathered has also been invaluable to the police and security services who have used it to help track known criminals and terrorists, supporting wider work taking place across government and law enforcement. While we do not accept the ICIBI’s overall recommendation that the exit checks programme be re-established, we do acknowledge more work can be done to realise the full operational potential of data collected. This is why we created a cross-departmental initiative before the exit checks programme closed, to look at how we collect and use data about the movement of people and freight into and from the UK. A number of today’s papers incorrectly report that the number of extra Border Force officers who will be in place for Brexit will be 1,300. Last year, we announced that Border Force would be creating 300 new posts to help prepare for leaving the EU. Those recruited to these new posts will allow experienced frontline officers to deliver more training to new and existing staff and they will start later this spring. At the Home Affairs Select Committee yesterday, the Home Secretary said that Border Force has launched a recruitment campaign for 1,000 officers to help further prepare for leaving the EU. But she made clear that these would be a combination of new posts and replacement officers for vacant posts. The campaign will provide Border Force with the flexibility to respond effectively to emerging requirements, including any future needs as a result of Brexit.